Back in the day (that is, the days of spending money as if we were earning income levels among the ranks of Donald Trump), we didn’t hesitate to spend hundreds of dollars every year on each of our four kids’ birthday celebrations with their friends. Four times every year, we’d have 15-30 kids come along for a birthday excursion at a jumping gym (you know, the ones filled with every kind of trampoline/bouncy house and giant slide you can imagine), the arcade, an amusement park or any other kind of fun and exciting kid kingdom. Looking back, I’d estimate that we spent roughly $300-$500 per child’s birthday party, so upwards of $2,000 a year, just on the kids’ “friend” parties. We justified these expensive gatherings by a serious desire to make life “happy” for our kids, and a need to fit in. “Everyone” threw expensive parties for their kids, so surely we were failing as parents if we didn’t do the same. It was only when we (finally) realized that we really didn’t make enough income (compared to our debt load) to afford these types of expenditures that we awoke to the realization that the expensive parties had to go and that we had to work to save money in this area. It’s not that parties like the ones mentioned above are bad, but they are bad if you have a mountain of debt, a high debt-to-income ratio, and no money to speak of in our savings account. 1. Minimize food served In the past, every friend party we threw included lunch and a store-bought cake. I grew up in one of those families where food equals love, so I have a heart for feeding people. Surely we wanted our guests to feel loved, but even with making food at home, you’re still looking at an easy $50 spent when you’re feeding 30 people. These days, friend parties include a homemade cake or cookies, maybe some chips, and a pitcher of lemonade served alongside a jug of water. Honestly, aside from the sweet treats, kids care a whole lot more about playing together than they do eating, so no love lost from our guests, and we’re able to save money as well when we choose to serve desserts and snacks only, as opposed to a full meal. 2. Forego expensive entertainment There are LOTS of fun games that parents can plan for younger kids’ birthday parties, and we’ve found now that our kids are older that they prefer to just be set free in the yard to play games of their own accord. Although the arcades and jump houses are fun, kids are usually just as happy to use their own creativity and plan their own fun. 1. Check for group rates at your local bowling alleys, ice skating or roller skating/blading rinks, or take advantage of outdoor public rinks. Most cities have plenty of options in this area. 2. Use the weather to your advantage In winter, plan to take kids sledding or make snow cones. In summer go for a hike/picnic or have a swim party at the local public beach. In fall, plan a trip to the apple orchard or applesauce making session. Younger kids can go on a leaf hunt and come home to warm apple cider. There are always inexpensive activities you can plan for kids’ birthday parties that will keep the kids plenty busy, and keep them learning new things as well. 3. Choose volunteer events for your kids’ party activities Bring the kids to pack food for third-world countries, pick up garbage in a local park, or have older kids serve food at a homeless shelter. Have friends bring donations for the food bank or humane society, and then deliver as a group and schedule a tour while you’re there. We’ve done several of these types of things for kids’ birthday parties. We follow it up with cake and ice cream at our house, and the kids leave with full tummies and an immense sense of accomplishment as they received the joy of making the world a better place. Bonus: volunteering in areas like these is usually free. While we no longer purchase store-bought balloons and banners at our kids’ birthday parties, we still decorate nicely for each birthday we celebrate. We now save money in this area by having the kids and their siblings design their own decorations, either by hand or on the computer, and we take basic ribbon (bought in bulk for the cheapest price), curl it, and hang it from the ceilings, doorways and on bannisters, etc. Guests love looking at the homemade banners and signs, and the kids get the satisfaction of knowing they designed something different and original. It’s often difficult in today’s world to be the parent that bucks the system and stop throwing spendy birthday parties for your kid and their friends, but we’ve found that not only does this save LOTS of money, but the kids have just as much fun as they did with expensive parties, and often more, because they’re doing activities that are new and different. 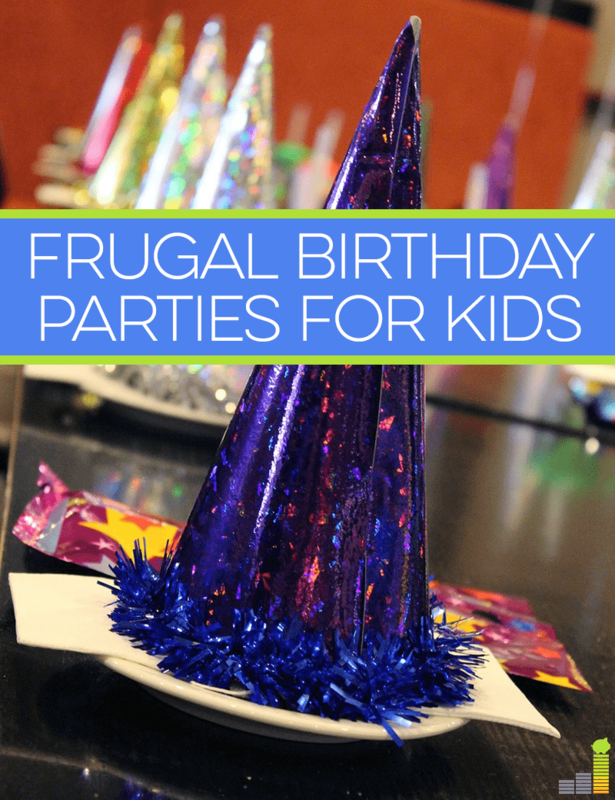 What types of frugal activities or events can you think of doing for a kid’s birthday party? What was one of your favorite birthday party memories? These are great tips! I know from entering giveaways that there are a ton of Mommy bloggers out there who have websites that are solely dedicated to giving you ideas for kid’s bday parties. I’m pretty sure they have a ton of frugal ideas on there as well, regardless of what theme you are going with. I could easily see myself falling in the trap of paying a ton for my kid’s birthdays, but hopefully when I become a parent I think twice before shelling out too much cash for them. Great post! We always had inexpensive birthday parties as a kid. One of my favorites was when my parents setup this series of games/challenges. All pretty basic but the winner would get an extra treat at each game and we absolutely loved it. So simple yet so fun. One of the best birthday parties we had was at a local school yard. We played a game of pick up softball with our twins and their friends. It was Team Autumn against Team Nick. I downloaded some baseball music like “charge’ and “take me out to the ball game” and we had hot dogs. A friend had a karaoke machine with a microphone so I played Mr. Announcer using that. Very little was spent and we had an absolute blast. That’s so great, Travis! Isn’t it the best when they still remember it all those years later? We’ve only had one birthday party so far, and our son had no idea it was actually a birthday party, so I don’t have too much to add. Although my dream is to harken back to my camp counselor days and bring some of the popular cabin activities to things like this. There are so many fun games you can make up and play as long as you have a little outdoor space, and they will cost you almost nothing. When I was a kid, we’d have 10-15 kids I was getting along to have a meal and then play. We didn’t decorate the houses too much, so no expenses there. And the meals were home cooked anyway and not too big (some sandwiches mainly). We also had our own cakes made at home. It wasn’t that expensive and we really had great fun. Since our daughter is not yet born, we haven’t had any parties for her. But we’re planning on keeping them small and sweet. Having a daughter who is 4, my biggest takeaway from kids birthday parties is how efficient they have become. From start to stop-2 hours like clockwork. No matter if they are at a personal home or third party site, the format seems to be the same: play, organized games, cake, presents gone. It actually makes my head spin watching the process. We put our party on for our daughter at our house with a Jake and Neverland Pirates theme. All the parents were intrigued by the treasure map scavenger hunt we created for everyone and the pirate ship cake that we made was a big hit. We have fairly frugal parties. I bake the cake (or cupcakes) myself and we just let all of the kids play. Sometimes I splurge on renting a bounce house for everyone but I think it’s well worth the $100 I spend for the special occasion. My kids don’t get gifts and toys throughout the year so I like to make their birthdays special. Sounds like you’ve got a great balance, Holly! I agree too about making the birthdays special – it’s great memory making stuff, isn’t it? I have thrown 2 parties for the oldest little 1500. The first was at a local pizza place the day before the Super Bowl. He had nothing going on, and for $50 let 9 little girls make their own pizzas, then we played a variety of games I found on the internet. I spent less than $100 on the whole affair, including a cake from Costco and a few Hello Kitty party favors. The next party was at one of those indoor playgrounds. I think it was more along the lines of $300. Never again. If you tell parents in the invitation that there will or won’t be food, they will make sure their child arrives fed or hungry. You said it best, the kids just want to play together. Another way to save money is to buy party favors at thrift stores, garage sales or on clearance. If you get there after a holiday, you can find holiday themed items at deep discounts. Wow, Mrs. 1500, great insight here, and I’ve had similar experiences. The pizza party bday sounds like it was a great hit, and how nice of the owner to be so laid back and helpful about the whole thing. Love the tip about picking up favors as thrift stores and garage sales – huge money saver there! I think those are really great ideas. I like the volunteering part, it could teach those kids how to be responsible and be good citizens of the world. It really does do that, Mark. And what’s more, the kids had fun doing it. These are awesome ideas. It’s smart to bake a cake instead of buying one. I’ve always had large sheet cakes for my birthday growing up and everyone would eat it only the first day. So we ended up throwing most of it in the trash. When I was a kid, every year my mom would do a peanut hunt and we’d all get to keep the peanuts we found around the yard. She’s also do this thing where she hid puzzle pieces around the yard and their were two teams, each had to find their pieces and assemble their puzzle before the other team. What great ideas, Stefanie! I’ll definitely be filing them in my game databank! For a soon-to-be mom, I love those tips! I like that parenting doesn’t have to be a life sentence of overspending and never being able to get out of debt. Great tips! I also came from a household where food = love, so get-togethers were always gluttonous and plentiful (so much so that there would be take-home boxes available for the guests)! These days, I agree with less food, and less over the top entertainment – I think it drains out a kid’s creative soul with all the brainless stimuli these days (though perhaps I’m just intimidated that my friend’s 3-year old knows how to work an iPad better than I do). Funny about the take home boxes – even my gluttonous family isn’t quite that gluttonous. 🙂 Seriously though, Anna, you’ve got a great point about the draining of kids’ creative souls these days. This is one of the things I love about our birthday parties of late: we simply send the kids out back to play, “forcing” them to create their own fun, and they never have a problem filling the bill, that’s for sure. These are some very useful tips that I’ll have to keep in mind when I have kids. I didn’t really realize how costly they can be if you don’t try to do it frugally. It’s crazy that only the birthday parties would cost upwards of $2,000 for 4 kids. That’s not even including the gifts you may give them. Maybe I don’t want kids… haha. My parents always threw us what would now be called “frugal” birthday parties. One of the ones I remember the most was when my friends and I painted pots (like for potted plants). This was extremely cheap and fun! I will never forget that birthday. Oh and my mom always made our birthday cakes. I think one year I got a store bought one, but that was very different than usual. Great idea, Buttercup! My kids would love to do the painted pots! Love the homemade cakes too, and my kids have a blast decorating them however they wish. Great tips, Laurie. You are so right – the kids really just want to play together and have fun. Lauren is at the age where she wants sleepovers so it’s a smaller group of friends, which is really nice. I don’t know if Mom could handle 15 girls overnight. She would need to spend the next day at the spa! Last year Lauren managed her birthday budget too, and it was a lot of fun watching her try to figure out how to get as much as possible out of her budget. She will do it again this year and I can’t wait to see what she creates. LOL, I totally agree about that spa trip, Shannon. 🙂 LOVE the idea about letting your kid manage their birthday budget – we’ll have to look into this for next year! My sister alternates between doing a “big” party and a “small” party every other year. On the small party years it is usually just dinner with family. On the big party years the kids are aloud to bring friends. I think that is a pretty good way to save some money. That’s a great idea, Nick! I’ll bet she saves a pretty good chunk of change doing it that way. Great post! My parents always made our birthdays special, though we didn’t have a big blowout every year. I remember one part where my mom got basic balloons from the party store and then used decor from around the house to set up the table. It was the most amazing display and I still remember being in awe of it. My parents also let me have a sleepover when I was in elementary school and my dad bought us donuts for breakfast. Low-key and low-cost but loads of fun! It’s the simple things that really make those parties special, isn’t it Kendal? Donuts in the morning for kids is almost like Christmas – I’ll bet your friends loved it too. Thanks for sharing the fun memories and great party ideas! 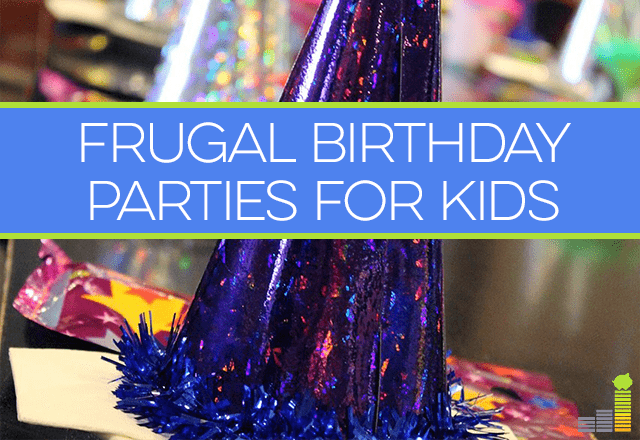 As I do not have children, I have no tips for frugal party ideas! That being said…some of my most memorable and favorable birthday parties held in my honor have been spent with a close friend’s family of five children. One of the youngest girls, who is now 14 makes me a home made cake each year and the other girls make me home made chocolate chip cookies and home made cards. It is a wonderful evening of chatting, playing a game called Pig and just enjoying my “extended” family. Thanks Laurie for a great post and take care. All the best. My mum used to buy a super cheap round cake, cut it in half, fill it with chocolate, close it back, cover it with chocolate, decorate with Smarties. All the kids loved it. Then we went to McD because they took care of everything and it was about $7 per kid and you don’t have to clean up the house. Love that idea, Pauline! Your mom is one smart woman. 🙂 Thanks for sharing the memories. Some of my favorite birthday parties for my children were just simple parties at home with friends and family. So agree, krantcents. Just the joy of watching the kids play is plenty for me. We did the whole bowling alley thing last year and it was a disaster, but really not that expensive. When they kicked us out before our time was actually up, we went to the park across the street. After everyone when home, I asked my daughter what her favorite part was and she said playing in the park! I think we’ll just do that for free this year. You need to hook me up with a good cake recipe. My baking skills leave something to be desired. Great tips! These are very simple things that people often overlook. Definitely worth sharing to parents and future parents. Thanks for this. Thanks for the tips! I don’t have kids yet but I will be using these tips when it comes time. Doing a potluck is also a great way to be frugal when planning a party. Have a great day!